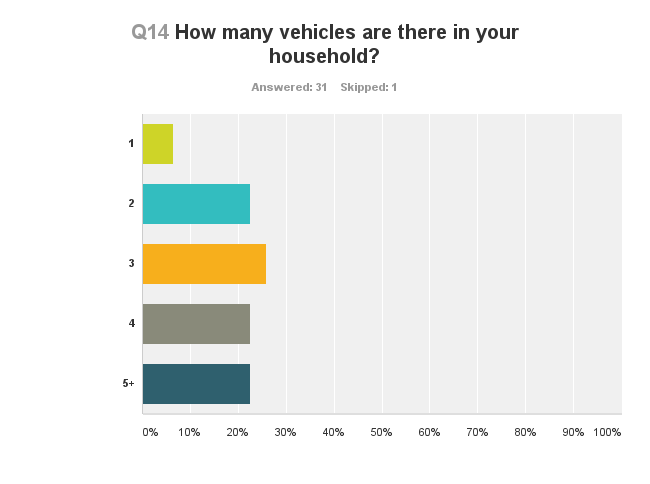 A very big thank you to all that took the time to fill in the quick survey posted late last week, I've closed the survey now. 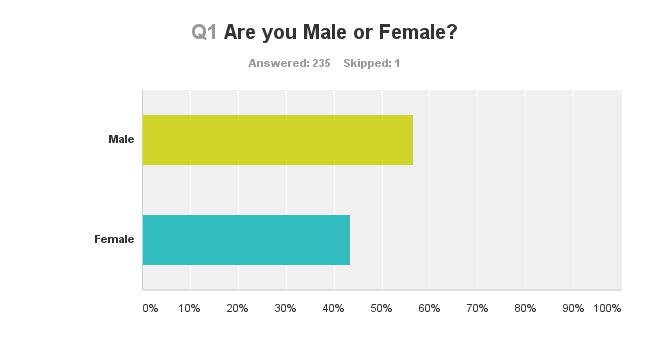 236 replies were given and I've seen some interesting results. Now, the audience of Muscat Mutterings is only really indicative of a few specific groups of people living in Oman - mostly expatriates from Europe, but also a significant group of people from India. 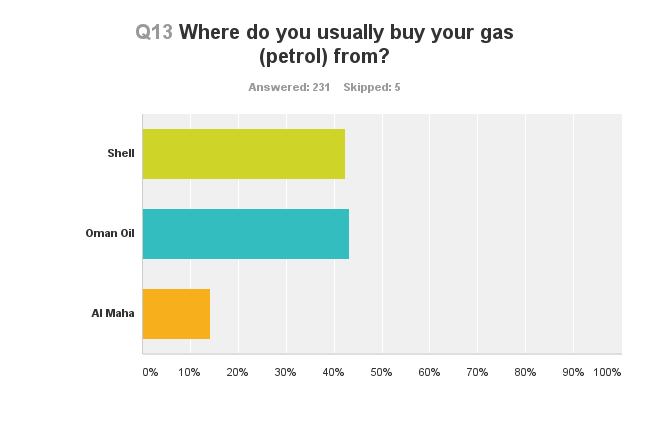 The point being, the results shown here are only indicative of some of the people living in Oman, and not all. Right then, on with the graphs! Again, a fairly balanced split. 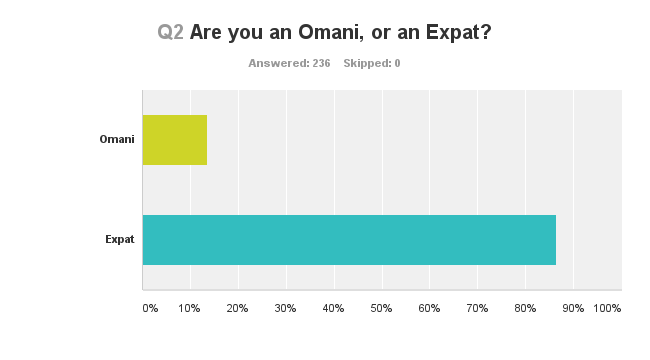 Moving on to Q2, about 13.5% of all responses were from Omani's - I was hoping for a few more responses, but hey, this blog doesn't really target many Omani's in the first place, and I'm grateful that more than 1 in 10 are actually native to Oman. 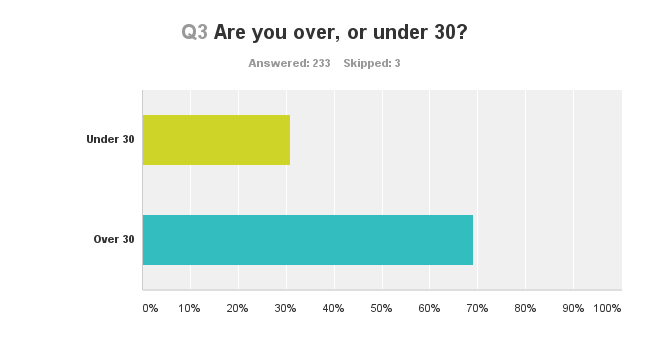 Now, more Expats are over 30, and more Omani's are under 30, I won't show the split here, because it doesn't really add anything. Time for the first meaty question then. 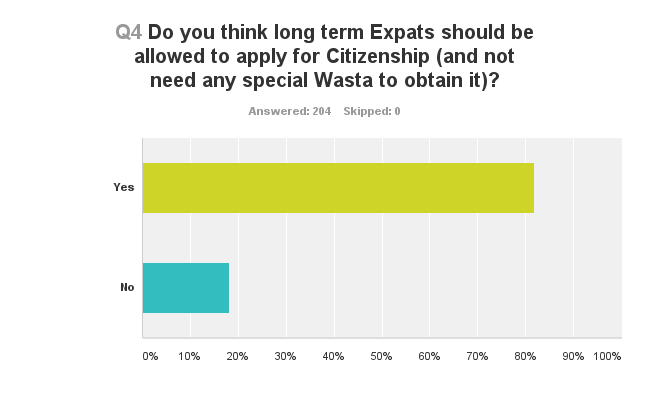 I must say I'm not sure why so many respondents (21%) thought that people should not have the right to apply for unhindered immigration to Oman. 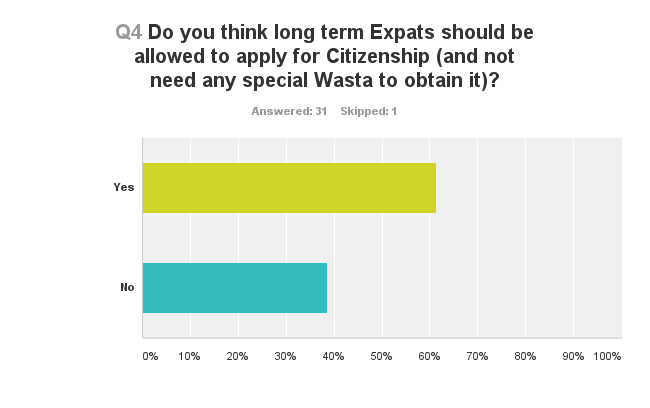 And it's not just Omani's that think that, in fact, most Omani's think that you should be allowed to immigrate as a matter of application, and without having to apply wasta. Interesting, that. For those that said that people should not be allowed to become Omani citizens, I'd like to know why! Nothing too surprising there, except an alarming number of you get yours news from blogs! 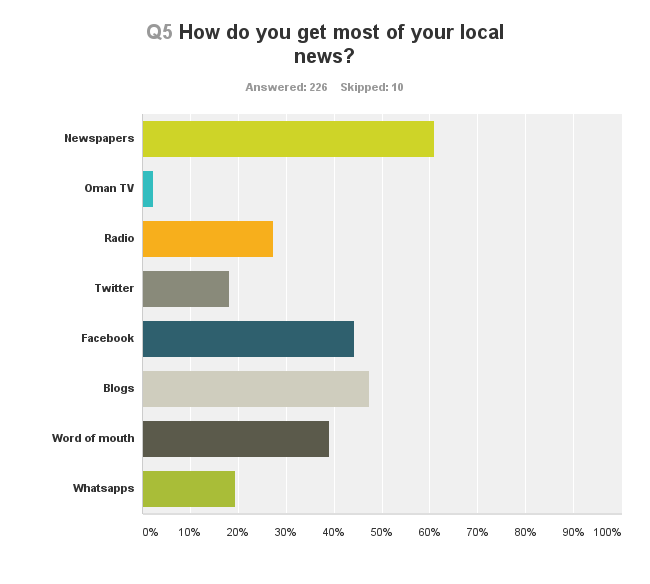 The Omani respondents 1st choice was also newspapers, but their second was Whatsapps! Hi FM remains the most popular choice for readers of ze blog but there isn't a lot in it between Merge and Hi these days. 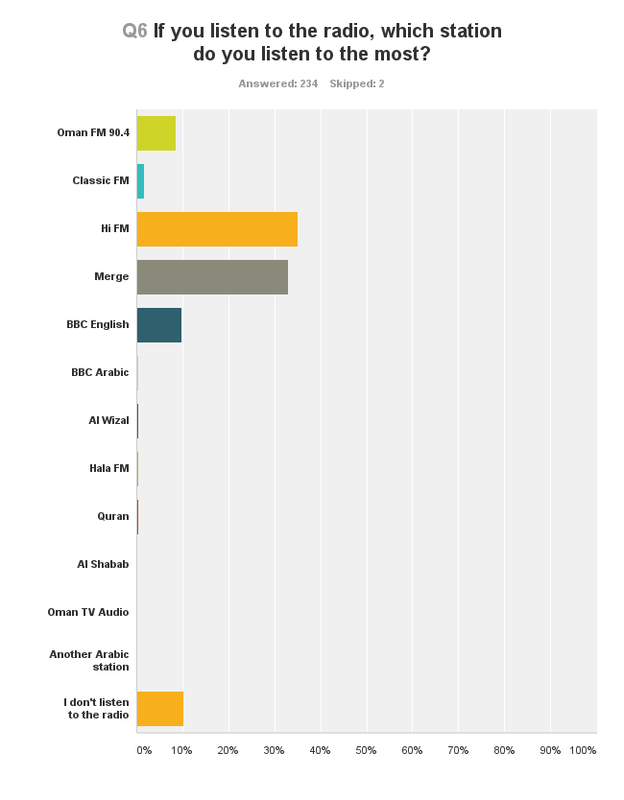 BBC English has more listeners than 90.4, considering it's only just launched, thats got to be a tad embarrassing for the 90.4 people. 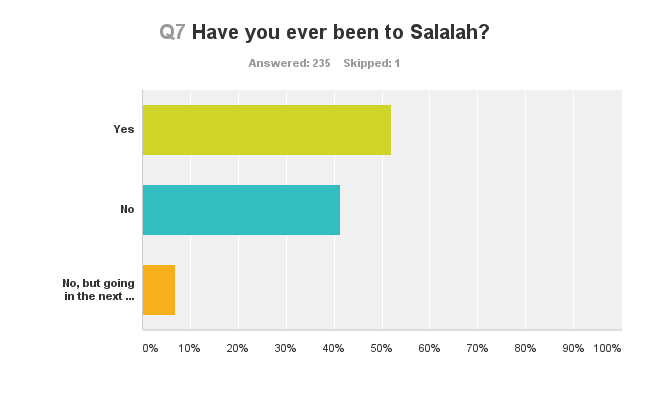 So more of you than not, have been to Salalah - the domestic tourism people should be happy about that! 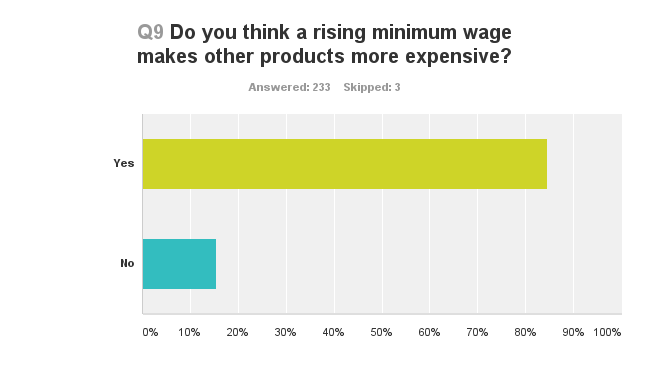 An overwhelming majority here say yes, minimum wages should be the same for all. I probably should have clarified that basic wage should be the same, and not all the allowances. Employers here often provide accommodation, transportation and medical insurance for their expat employees, things that are not necessarily required by Omani's. 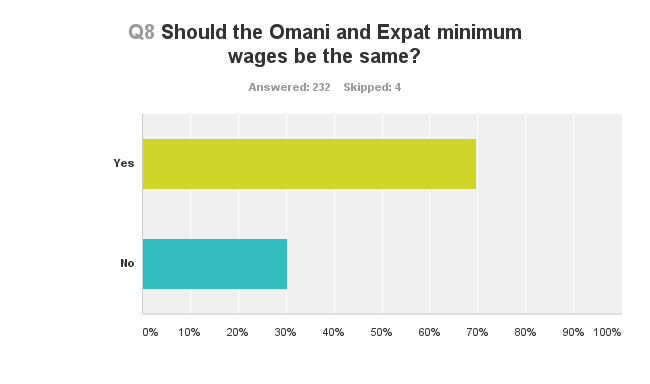 70% of Omani responses agreed, that minimum wages should be the same - the same (70%) of Expats also agreed. 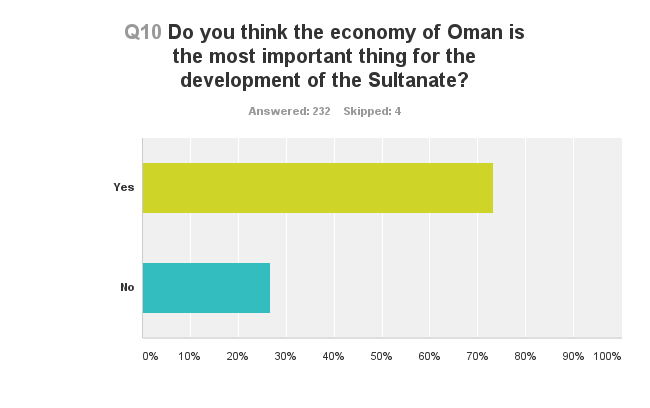 Again, quite a large number of respondents think that the economy of Oman is not the most important thing for the development of the Sultanate. More interestingly, 90% of Omani respondents thought it was, whereas only 70% of Expats thought it was. Being a die hard capitalist, I'm glad those Omani's that did reply to this, are also of the opinion that the economy of Oman is the most important thing for the development of the Sultanate. 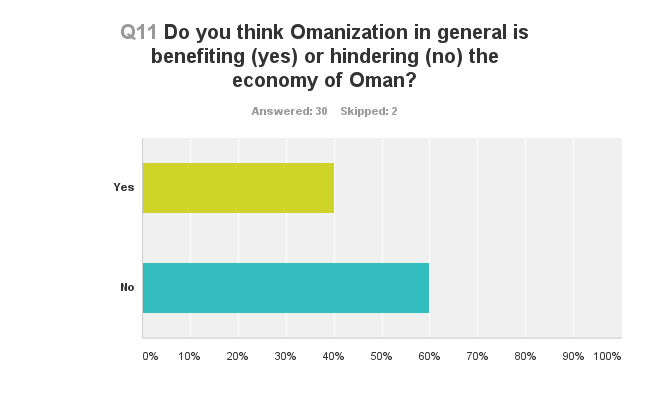 Well then, 75% of you think that Omanization is indeed hindering the economy of Oman, and as a general trend, one can draw the conclusion that Omanization is hindering the development of Oman (when polling the respondents of this survey). I'd imagine this would be different should we ever manage to get all residents and citizens of Oman to answer that question though - lots of Omani's have jobs and income because of Omanization, and quite frankly, if I was one of them, I'd be very grateful, and certainly wouldn't think Omanization was hindering the economy. 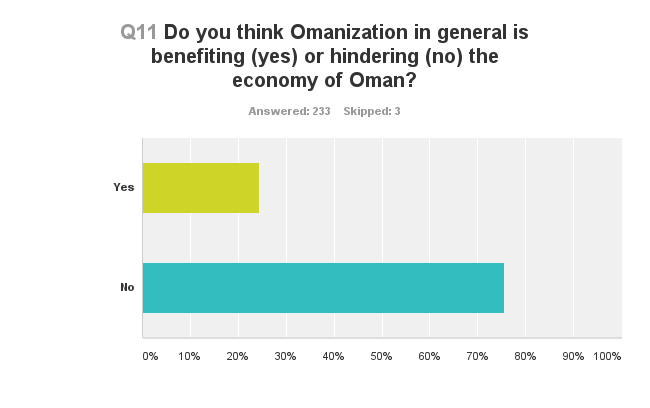 So even more Omani's think that Omanization is hindering the economy (and by extension the development) of Oman. I don't think there is any silver bullet to the employment problems for citizens of Oman in the short term, but perhaps de-regulation in a pilot market could help - perhaps manufacturing or something similar - I dont know, but it does look like a bit of a rethink might be required. 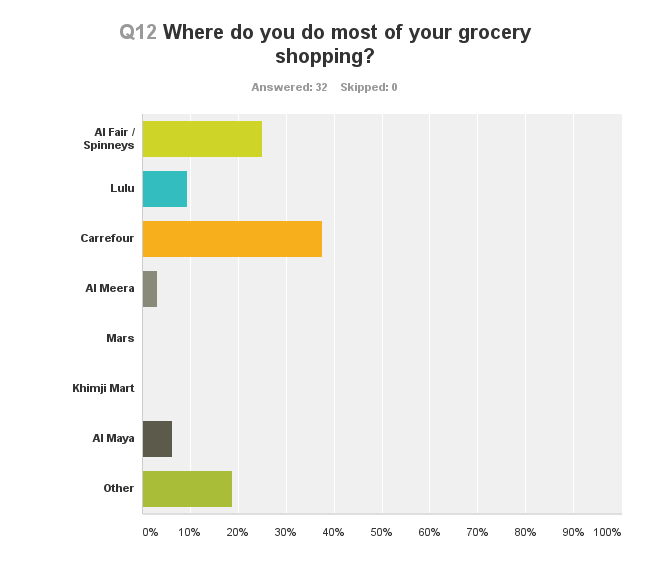 Omani respondents also chose Carrefour as their 1st choice, but lulu's came a lot lower in the ranking. I wonder if Lulu's targets middle class Omani's in its marketing? 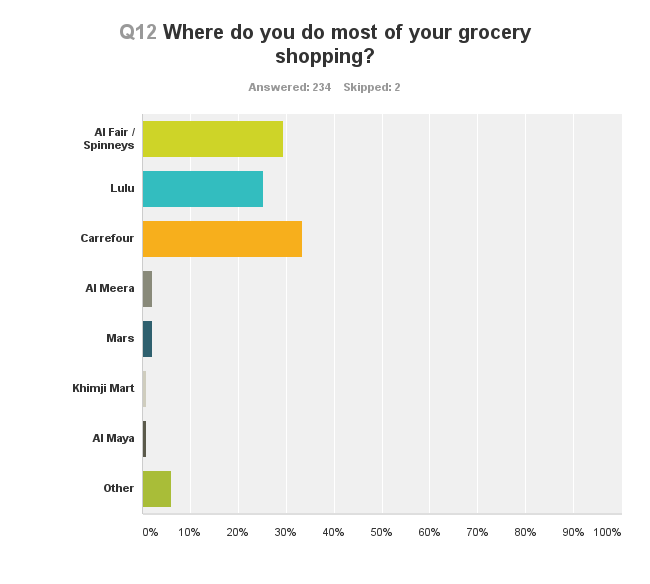 And what is the "other" store they shop at? Markets? 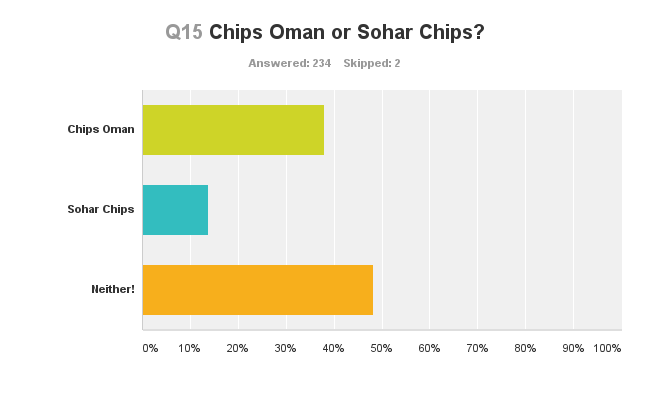 Right then, as the overwhelming majority of you are Expats, and the overwhelming majority of Expats voted Neither in the Chips Oman V Sohar Chips question, the biggest answer is neither. 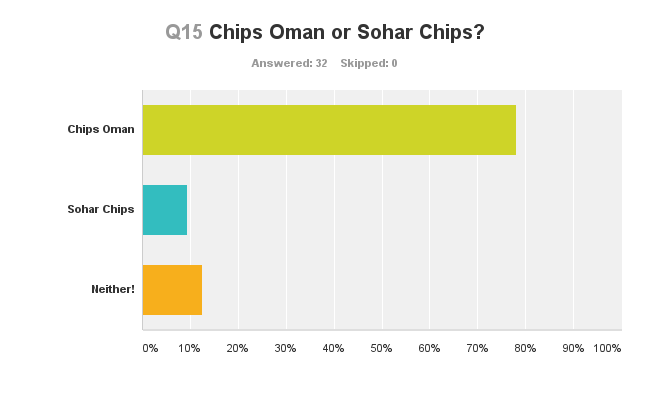 However, when just looking at the Omani responses, Chips Oman is the clear winner! Omani's sure do love their Chips Oman! 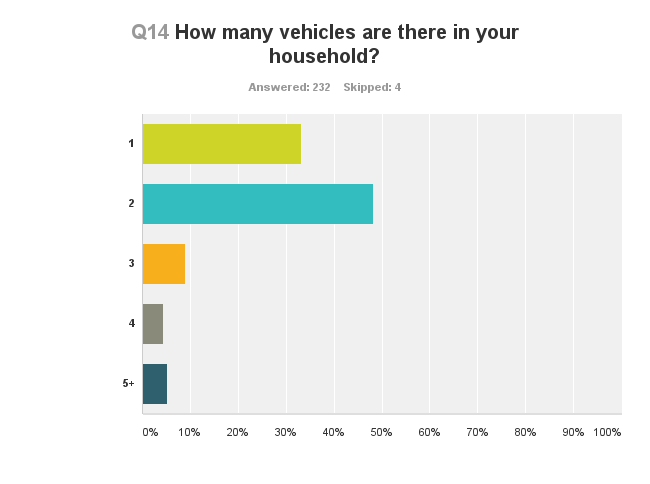 Thanks again everyone for taking the few minutes to fill in the survey, it has given me something to write about, and some interesting insights into peoples opinions and preferences here in Oman. If you'd like the raw data, drop me an email on mrsythe [at] gmail.com and I'll send it to you. If you are from a business and want to use my data, thats fine, just be nice and reference where you got it from.